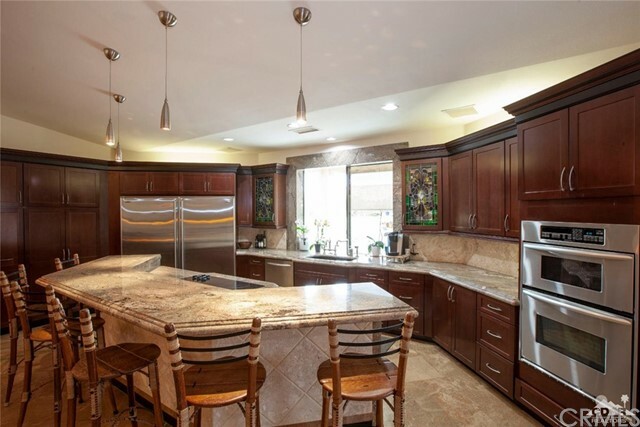 Conveniently located close to the main gate of Bermuda Dunes Country Club, this exceptional entertainers home, with highly upgraded flooring and granite counters and top of the line stone work throughout is on the market for the first time! Highly upgraded flooring consists of Noce Travertine in the indoor common areas, marble in the bathrooms and wood in the bedrooms. A chef's eat in kitchen, sporting granite and marble, is the focal point for gatherings. A wet bar and built in entertainment center, with full home wiring system are fantastic upgrades! Boasting an oversized and very private interior courtyard with water feature, this home is ideal for get togethers! 4 bedrooms plus Den and 4 baths along with the highly desirable open living concept make this home a must see. Steps to the community pool, and close to the main entrance of the club, makes this location hard to beat! Call us today to set your private tour!